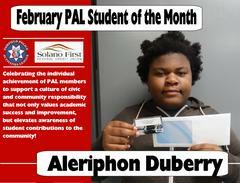 Aleriphon Duberry selected as February 2019 PAL / Solano First Federal Credit Union Student of the Month! Fairfield PAL member, Aleriphon Duberry has been selected as the Solano First Federal Credit Union Student of the Month for February 2019. The PAL student council and staff unanimously selected Aleriphon. Aleriphon, a 9th grader at Fairfield High School, is recognized at PAL for her positive attitude and courage to try new things. Upon hearing her nomination, the entire PAL Student Council gasped in complete agreement. The Fairfield PAL program offers Fairfield, Suisun, and Travis teens a place to grow, learn, and build the skills they need today and in the future. The PAL Center offers teens a safe environment, supports working families and helps students achieve by giving them opportunities right now. The Fairfield PAL Program is open to Fairfield, Suisun, and Travis students ages 13-18 who are enrolled in school. Memberships are $10 per year and can be purchased at the Fairfield Community Center (1000 Kentucky Street) Mon-Thursday 11:30am – 5:30pm. A current student ID is required to register. For more information about these PAL activities, please call 707-422-6288 or visit the program’s website at www.fairfield.ca.gov/PAL or follow us in real time by visiting the program’s on Facebook @Fairfieldpal1, Twitter at @pal_fairfield, or Instagram at ff_pal_center.